Suberb Lyrebird from Australia is one of the world's best mimics. The famous BBC series with David Attenborough has brought forward a number of contestants for the “1000 birds to see before you die” project. I think most of the will qualify when I get the final list out by the end of this week or early next week. The Superb Lyrebird Menura novaehollandiae is one of the best mimic in the world. It imitates the birds around it, but also camera shutters and car alarms. The male clears an area in the forest and makes this its display ground. Another species is Albert’s Lyrebird Menura albert, which occurs much more localized only in Southern Queensland. 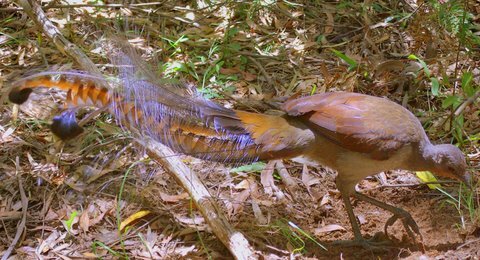 Where to see Superb Lyrebird. The Superb Lyrebird occurs in rain forest in in Victoria, New South Wales and south-east Queensland, as well as in Tasmania where it was introduced in the 19th century. It is not too difficult to see. Locally, the display sites are well known. Display occures between April and September. For more information see this great article. Please let me know any link all of a sudden does not work. Superb Lyretail photo Rick Ryan under Creative Commons license. All photos made by Gunnar Engblom on this blog may be used under Creative Commons license as long as they are attributed the original article with a link. 1000 birds to see before you die – the book project. Next post: Fear of Twitter? Do a two week test run!